Another visit to The Lobster Place in Chelsea Market resulted in the purchase of a small portion of perfectly glistening tuna belly. I love buying fish just because it looks great. Is there a better way to shop? How to prepare it? Pan-seared? Raw? 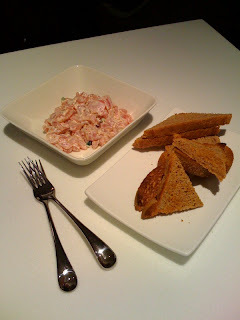 I love tartar, but had never tried making it at home before. It could not be that hard. Basically stir all the ingredients together in medium bowl and serve with hot whole wheat toast points. A really simple and fresh tasting appetizer. I paired this with a dry sparkling Vouvray (Pinon NV Vouvray Brut) and it was a magic combination. Pinon's wine are an amazing value and always excellent. The bottle had been open for three days, but it was still fantastic: biscuity, appley, bright. This wine is from grapes from a plot of very old vines. For $21 this should be everyone's house sparkler. Bad Shrimp? Which one did I throw out? Tampa's Ybor City - Where's the Authenticity?